RORC video above published Feb 27, 2018: The RORC Caribbean 600 has grown up to become a 'must do' offshore classic. The 2018 race celebrated its tenth anniversary and the 600-mile race around 11 Caribbean islands is on the bucket list of any serious offshore sailor. This year, any remanence of its stature as a Caribbean cruise was totally extinguished. 25 knots of solid trade winds with gusty squalls and a confused sea state delivered a challenge to over 800 sailors from six different continents. The 2018 edition of the race was the coming of age of the RORC Caribbean 600. 84 starters, 41 finishers, 43 retirees. RORC video above published Feb 23, 2018--10th Edition of the RORC Caribbean 600 - First Finishers: "We're delighted to have won overall in IRC Rating​ and better yet to have broken our own record at the same time.” - George David, Rambler 88, winner of the 2018 RORC Caribbean 600 Trophy. George David's American Maxi Rambler 88 has won the 2018 RORC Caribbean 600 Trophy, scoring the best corrected time under IRC. Rambler 88 revelled in the heavy airs race, setting a new monohull race record and by winning IRC Zero, completed a hatrick of trophies. Rambler 88 scorched around the track in an elapsed time of 37 hours 41 minutes and 45 seconds, beating the record set by George David's Rambler 100 in 2011 by nearly three hours. On hearing the result, George David commented: "In ten years the '600 has gone from a handful of boats in its first edition, to 84 on its tenth anniversary. It's a great race all around; congratulations to the RORC and everyone involved. We're delighted to have won overall in IRC and better yet, to have broken our own record at the same time." RORC video above published Feb 19, 2018: A record 84 yachts started the 2018 RORC Caribbean 600 in Antigua on Monday 19th February. - the largest fleet in the ten-year history of the race. The impressive armada set off in unstable conditions with squalls producing a wind range of over 20 knots, and as little as 10, with some big shifts in direction. High seas and strong trade winds are expected for the race, with the anticipation of record breaking pace. UPDATE: Royal Ocean Racing Club: "Race Rambler 88 breaks RORC Caribbean 600 Monohull Record--George David's American Maxi Rambler 88 set a new monohull race record in an elapsed time of 1 day 13 hours 41 minutes and 45 seconds." RORC video above published Feb 19, 2018: 2018 RORC Caribbean 600 Race Preview. Royal Ocean Racing Club - How to follow the 2018 RORC Caribbean 600: A record fleet of yachts from around the world will start the 10th edition of the 2018 RORC Caribbean 600 from Antigua on Monday 19th February. Start times: 1100: IRC 2, 3 & CSA, 1110: IRC 1 & Class40, 1120: IRC Zero & Superyacht, 1130: Multihull. RORC video above published Feb 15, 2018: Sevenstar Racing Yacht Logistics Division is headed by Wouter Verbraak, a world leading professional sailor who knows the ins and outs of running a top racing team. He has vast experience in the offshore racing arena and has won many of the world’s biggest sailing races with his strategic skills and team approach. If you cannot escape the office for sunshine and 28 degree warm water, then enter the Virtual Regatta race from the comfort of your armchair! LIVE Tracker Team AkzoNobel wins Leg 6. See also Virtual Eye. Volvo Ocean Race | Leg 6 Start in 65 seconds - Volvo Ocean Race video published Feb 7, 2018: The start of Leg 6, Hong Kong to Auckland, of the 2017-2018 Volvo Ocean Race in 65 seconds. See also Full Replay of Leg 6 start. Skippers preview Leg 6 | Volvo Ocean Race (Volvo Ocean Race video published Feb 7, 2018): Volvo Ocean Race skippers look ahead to Leg 6 from Hong Kong to Auckland – a stage that Dongfeng Race Team skipper Charles Caudrelier describes as potentially one of the most 'dangerous' of the race. Volvo Ocean Race 2017-18 Leg 6, Hong Kong to Auckland NZ, starts Feb 7, 2018, from Hong Kong--it will take the fleet across the South China Sea to the northern tip of the Philippines. After that, it’s out into the Pacific and a long drag race to the south-east, dodging the many island chains of Polynesia until they reach Auckland. 6,100 nautical miles nonstop. Volvo Ocean Race current standings here (Top three: MAPFRE, Dongfeng Race Team, Vestas 11th Hour Racing). Update from Vestas 11th Hour Racing - Volvo Ocean Race 2017-18: Vestas 11th Hour Racing, which was involved in a collision with a non-racing vessel at the end of Leg 4 near Hong Kong, will not rejoin the race in time for Leg 6 – the yacht has been loaded onto a freight vessel in Hong Kong for transportation to Auckland for repairs. "How fast can one person sail around the world? Last year we thought we knew, but 12 months later when Francois Gabart smashed the previous record, the sailing world drew breath. Was this the ultimate limit to the ultimate challenge? 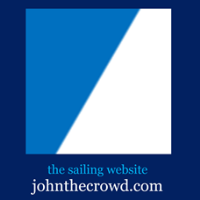 To find out, we looked at the history of round the world record breaking and talked exclusively to Sir Robin Knox-Johnston, the first man to sail solo, non-stop, around the world about how times have tumbled and what lies ahead. In addition, we go to Nassau in the Bahamas to witness an extraordinary victory as the world’s best compete in a champion of champions showdown. We also re-visit the grueling Volvo Ocean Race as the fleet careers though the Southern Ocean before parking up in the Pacific. Plus, we take a look at the controversy in the Rolex Sydney Hobart race."